In the early evening of January 24, 2019, a bus driving on the interstate in Parsippany crashed into several cars. One person was killed and thirty-six injured. The cause is not clear. In NJ, hearing this promotes a sense of deja vu. Because the high number of people who ride buses to and from their jobs each day here, buses permeate our roads and interstates and we hear about horrific crashes with far too much regularity. A bus driver or other driver not being attentive to the road. These days this is often a result of a driver using a cellphone. Although it is not the first thing that comes to mind, bus accidents occur without any fault of the bus driver or bus company. Bus accident victims suffer long term and short term harms. Doctors’ bills and not being able to return to work immediately can cause financial stress in the immediate aftermath of the accident. The most serious injuries may result in living in pain or the lack of ability to partake in activities that one used to enjoy and can lead to a life with pain, disability or decreased earnings. Bus accident victims often need medical care. Finding the insurance carrier responsible to pay these costs is not always straightforward. An experienced bus accident attorney will help you make sure these invoices are sent to the right insurance company. Insurance companies have the exact opposite goal as you do when trying to settle a claim for an injury. The company wants to pay as little as possible to increase its profits. An attorney will be experienced in working with the insurance company to maximize your compensation. Who is Held Responsible for a NJ Bus Accident? Driver of the bus: A bus driver may be responsible for a collision if he or she failed to drive safely. Drivers of other cars and motor vehicles: Other drivers on the road certainly may cause a collision if drive in an unsafe manner. 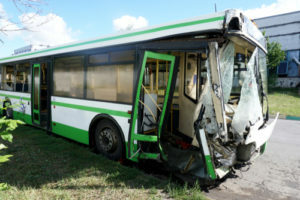 Bus operating corporations: If a bus is not well cared for and this has something to do with the accident, the bus owner can be found to be responsible for a percentage or even all of the damages. Bus makers: The bus manufacturer can be responsible if a defect in how the bus is manufactured helped to cause the collision. New Jersey usually gives you two years from the date of the accident to file a lawsuit against the responsible parties. However, if the responsible party is the State government or a local government you need to file paperwork with that governmental agency within ninety days of the accident. Usually these deadlines cannot be extended. However, different rules apply if the victim is a minor. You should consult an attorney immediately after a bus accident to be sure you are not losing your right to collect damages. Did you or a loved one sustain serious injuries due to a bus crash in New Jersey? Don’t let the medical bills pile up while you wait for the negligent party or their insurance company to do the right thing. Right now, you need an aggressive personal injury attorney on your side, fighting to get you the compensation you need, want, and deserve. The skilled attorneys at Lombardi and Lombardi, P.A. represent clients injured because of bus accidents in Lakewood, Toms River, Brick, Jackson and throughout New Jersey. Call 732-709-7992 or email us to schedule a free consultation about your case. We have an office conveniently located at 1862 Oak Tree Road Edison, NJ 08820 as well as offices in Brick, Freehold, and Point Pleasant, NJ.